I got to witness an absolutely incredible moment, the result of incredible timing for our group of middle school kids from Richmond, CA. From when we first saw her in contractions to delivery was only a few short minutes, and a few hundred shots… It was an amazing thing to witness, the mother was showering herself with sand to keep cool and grunting at her neighbors but it all seemed to go easily, quite stunning, only slightly gross. I’ve be posted a stack of images from the delivery, and the after birth drama with the gulls going ape over the placenta. 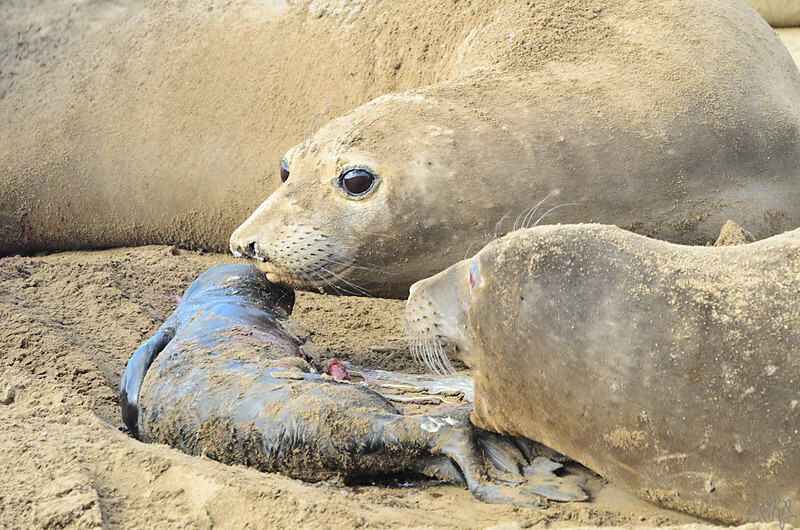 The bonding after between the mother and pup was really wonderful. Add to this the fact I’m 3 weeks out from the birth of my daughter It was quite a day, very emotional and very blessed to have witnessed this. Hope it all goes this smoothly for us, only without the seagulls afterwards perhaps? The streets sure are pretty after some Oakland rain. In the beginning, the earth was without form and void. Then Fisher said, “Let there be z-scores and ANOVA” and there were z-scores. And Fisher saw that regression was good, and he separated the significant from the nonsignificant. Had my first birthing class last night, very scary to be honest, but exciting. So I’m now 6 weeks away from my anchor baby arriving, we’re gonna take over the USA, one Aussie fathered child at a time. It could take some time, and some convincing of my wife but we’re gonna toughen up this country. Get ready California. An Open Letter to Oakland: Innovate or stagnate. Today in SF one of my favorite organizations had a big launch event with Mayor Ed Lee. I’m incredibly proud to have been a program mentor for Code for America in it’s inaugural year and have gained so much from my involvement with and support of CfA this past year. I swear that at every single tech, geospatial, gov and urbanist event I’ve attended in 2011 I’ve run into CfA fellows and have had great conversations and felt a huge kinship with the amazing people who have volunteered their year in service of our country. Today the CfA CEO Jen Pahlka and the Mayor of SF announced the new accelerator startup that that will partner with cities to help streamline city processes and apply the innovation and energy of the startup tech world to the challenges of city government in SF and other cities. Also announced was the move of Jay Nath from the SF Tech Dept to the Mayor’s new Chief Innovation Officer position, congrats Jay and very impressive decision by a proactive Mayor Lee! What does this usual tech innovation and government transformation mean to us in the East Bay? Firstly we need our city leaders and officials to recognize and support the great wealth of talent we have in the technology sector in Oakland. San Francisco is seen as the hub of tech innovation, but the reality is that Oakland has this facet also- Pandora is my personal fav of the Oakland tech startups to make it, and is a great employer in our city. Given the turnout at the first Code for Oakland event we helped run last year and the recent OpenData Day Hackathon we ran, it’s very clear to me how many interested, talented, creative technology developers we have in our town, and the reality that too many of our leaders do not appreciate is that these professionals want to support, improve, grow and celebrate our city. Secondly we need to encourage a culture of innovation and creativity in city government, especially in the realm of technology and community engagement. I’ve had a chance to work with many city staff across different departments and can draw out a long list of problems, failures and flaws that other cities in the CfA program have also identified as weak points and have now developed open source solutions to fix these weaknesses. Currently the city is leaderless in this space and our county is not far ahead of the city. There is no support of the local tech community from city hall, no spirit of entrepreneurship emanating from the city hall, no effort to be a platform for civic innovation and very little real engagement with this hugely talented pool of local software engineers who have a habit of finding incredible solutions to city tech issues. This frustrates the crap outta me. As a city we have all the ducks lined up, all we need is a city structure that supports and leverages the opportunities and tools already built. Our government can and should be a platform for civic innovation and new tech startups. But what needs to happen first is that the city shows some intentional leadership on this. Like San Francisco we should create a role for an Innovation Director for the city, either in the Tech Dept or in the Mayor’s office. We should also consider the need to have the ITD director as a cabinet level position- technology is not just a bunch of back room nerds doing desktop support and the person responsible for all the city tech infrastructure should not be merely a director level with no strategic input at the Mayor’s table. This person would be empowered to motivate and mobilize our great tech community to help build new solutions for our city and to help adapt many of the tools built through CfA and in the Civic Commons to collaboratively improve our city technology solutions. Many of our tech problems have been solved in other cities and all we need to to is pick from existing open sourced applications and implement them in our town. Contracting processes: currently a small business contract with the city for perhaps a few thousand dollars requires the business to complete approximately 12 different documents, from word docs to locked PDFs, so they must print them all and fill them out by hand, and then submit copies. I can only imagine the city process for recording and managing these various forms when they are received. Take a look at the SmartPDF work in SF for a powerful solution, or just make the effort to combine all these forms into a single, fill-able PDF at the very least, and one day perhaps implement web based forms? Adopt an Open311 system for calls for service. This platform, developed in SF and DC is an open source 311 system that has open connectors and a new public dashboard feature developed by CFA. Very powerful and no proprietary software required. Work with the county to build a unified property addressing system. Implement Classtalk.org across the OUSD and help our teachers keep in touch with their students via SMS – perfect for a community with low internet access at home! Implement ChangeByUs, a great new tool for community engagement and collaboration. Implement an OpenData policy and work with our tech community to build an OpenData portal for our city. Free up valuable city data to encourage innovation, engagement and new startups! We’re doing this anyway, but it should be supported by our city! One glimmer of hope is the recent decision of the city Public Works agency to adopt a tool called SeeClickFix. This is the first tech move that indicates a move to more open, innovative software selection for Oakland and I’m excited about this move. We’ve already had access to this app to a degree but this new step means the city will be integrating this web based citizen reporting tool with it’s newish CityWorks platform. Finally a set of tools that have open interfaces and allow the city to connect to other systems as they are implemented. This is great, a good, forward thinking decision and we need much more of it! So congratulations for this. Seriously. I think our city has enormous potential to become a leader in this field, to be seen as a true innovator and a city of real collaborative efforts to solve our common problems. But our leaders need to step up and be real leaders in order to see this occur. Otherwise it will happen slowly and stubbornly on it’s own, and the city will not be recognized through this but will instead grow it’s reputation as an immovable, clunky, closed bureaucracy that did nothing to leverage the immense talent and interest of it’s residents. I love my town and I’m excited to work for an organization who supports civic technology innovation. If our city steps up we’ll support their efforts aggressively. Our town needs some positive PR, and this one is all ready to go! Winter colors at El Cerrito BART. I cannot overemphasize the joy of having a good quality camera on my smartphone, after two years of embarrassment over the piece of crap in the OG Droid, this HTC Rezound is awesome! I actually want to take photos with my phone again. magic. Not the car, the chaos that is my interest, passion and work in life. For a couple of years I’ve struggled to come up with a sensible, manageable approach to being more open (writing) about the diverse stuff that excites and motivates (yep and frustrates) me without creating a confused picture for a certain audience. So screw it, I cannot for the life of me figure out how to segment my thoughts on landscape photography, consumer tech, government tech, open government, democracy, opendata, geospatial, community engagement, social science research, community development, statistics, social justice movements and community development, public service, leadership, hip-hop and faith. No more hours trying to think of cool domain names for each segment of my life, this is me. Like you I’m something of a mess, but I have a lot of fun being this way. This lil ol blog will wander, diverge, sidetrack and hopefully at times focus. And there may be some additional lack of focus when my first child arrives soon, but I promise to keep baby pics out of here, did I mention how much I can’t stand Anne Geddes?